Over the next few weeks, we’ll be hearing from Akhil, a former Magoosh student who will be pursuing his MBA at Hult in the fall. Akhil will be writing about his experience with the GMAT and the MBA admissions process as an international student. You can learn more about him on his blog, and you can read his first post here. The GMAT takes the limelight when it comes to MBA applications. All prospective applicants shiver when they hear those 4 letters and therefore forget to see the overall picture of the MBA application. Yes, the GMAT is crucial but in my opinion, it isn’t the most important criteria which MBA admission teams consider. If you perform your research, you will notice that the majority of schools state that your MBA application is assessed in its entirety–which means that your essays, CV, work experience and references are equally as important as your GMAT score. Therefore why is there such a love/hate relationship between prospective MBA students and the GMAT? If you believe you have the relevant leadership potential, experience and the determination to pursue your goals – which should be reflected in your essays and your personal references – then why lose so much sleep over the GMAT? 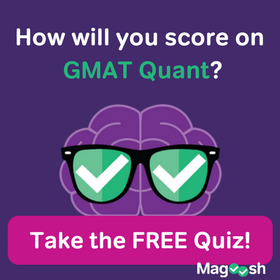 You may have also noticed that despite the fact that average GMAT scores in the top business schools are greater than 700, the range of GMAT scores that these business schools state in their admissions requirements usually starts at 550. If you read official MBA/GMAT articles or follow threads on popular forums, you will hear stories of applicants who were accepted in one of the top 3 business schools with a GMAT score lower than 600 and the same is true at the other end of the spectrum where applicants with 750+ GMAT scores were rejected. The point I’m trying to make is that the GMAT is important but it’s not the Holy Grail! Tackling the GMAT requires time, focus and consistency. The majority of exam sitters will be juggling many commitments such as work and family in addition to studying for the GMAT. It’s very easy to find excuses to not study. I remember when I first embarked on my studying routine I spoke to a number of people who said that they had acquired all the studying resources but then gave up within a few weeks due to having too many other commitments. I too felt that I had too much on my plate with my full-time job and triathlon training where I was on course to represent Gibraltar at the World Long Distance Triathlon Championships. Could I have delayed my GMAT test and applied for an MBA the following year? Yes I could have but it would mean waiting another year to start my MBA. So what did I do? I took it on the chin and continued studying for the GMAT. It was a long and tough 6 months before I sat my GMAT as I would be up in the very early hours to study for a few hours, before heading off to the swimming pool and finally heading off to the office for the day. After work, the routine would repeat in reverse where I would either go for a run or cycle, and then study to settle into the evening. My life had become a strict routine of eat, sleep, study, train, work, repeat – but it was all worth it at the end! 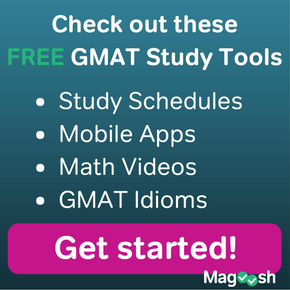 Apart from my own determination to get the GMAT out of the way, I had a lot of help from Magoosh – by far the best online studying resource available! One Who Is Highly-Learned, Wise And Generous. In Persian, “magush” means exactly that, and the Magoosh team stick to their word! Magoosh offers an amazing package of online video tutorials, a question bank and email support, all at a very affordable price. All I needed was an internet connection and a computer, tablet or phone – so I had no excuses to not find time to study! How does Magoosh differ from the rest of its competition? The answer lies in their video tutorials. As an engineer, my gut instinct whenever I see a maths problem is to perform the calculation the “long way”. By that I mean long division, long multiplication, and step by step calculations. I would eventually get to the right answer but would spend more than 3 minutes on the question. 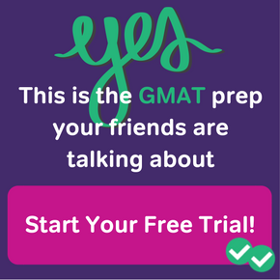 As we all know, the GMAT is a timed exam so you need to get a move on! The video tutorial below is a great example of how Magoosh enabled me to learn shortcuts and get through the questions succinctly. To obtain a high score in the GMAT you must understand that nobody cares how you get to the answer, as long as you get there. The quicker, the better! The same applies to the verbal section and the video tutorials provide a fantastic strategy to approach this section. Formulating a study plan is also important and where else to look other than Magoosh for some help in this regard. Magoosh offer various study plans to suit your requirements which you can fit around all your other commitments. 5. Take a few days off and then take 2 full practise tests (as per step 3). If I managed to get through the GMAT with a full-time job and my extensive triathlon training, then so can you! Lay out a studying plan that will work for you and take the GMAT preparation as a marathon and not a sprint. If you need help, there’s Magoosh who offers an incredible package with extensive support. All the best with your GMAT! Assuming with an engineering background this material is easier for you than most. Curious what your score was at the end of all this prep?